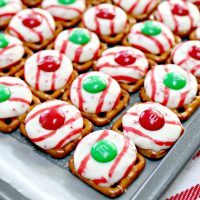 One of the easiest and most delicious holiday candies to make are these Peppermint Christmas Candy Pretzel Squares. They are the perfect mix of salty and sweet with a peppermint twist! Start by lining a cookie sheet with wax paper. Lay out as many pretzel squares as you like. For this batch, I used 60. Place a Peppermint Hershey’s Kiss on each pretzel square. Place them in the oven for 4-5 minutes. Carefully remove them from the oven. Gently place an M-n-M candy on the center of each one, softly pressing it down. Place in the refrigerator until ready to eat or gift.